From the first lot we lived on, if you went down a big grassy hill and crossed the road you’d find us by the river. In the summer, the sand could become burning hot in the sun, despite the glacial currents that flowed down from Labrador. Reels of dried-up seaweed revealed how high the tides rose and stretched out in arcs from east to west. We found green sea urchin skeletons, blue shells, and pink tampon applicators. Sometimes we would step on a piece of glass polished by the salt. It would slide so smoothly between our fingers that we could barely imagine its sharp past. When we held it up to the sun it would look like part of a stained-glass window washed up on the beach at Matane. Coke and Pepsi bottles produced translucent shards of polished white. The green bits of glass came from 7UP bottles. Beer bottles splintered into small, dark amber pieces. On this strip of beach, the waves deposited at our feet the shattered stained-glass windows of a church sunk off the Matane coastline. My sister and I picked up the pieces without ever beginning the impossible task of putting them back together. We knew that they had once been part of a whole, but that an earthquake had probably separated them. The sea salt had made them smooth so that their edges no longer fit together. They had taken on a shape all their own. They could be traced back to a family only by their colour. A distant kinship. They had ended up where the Gulf of St. Lawrence melts into the northern blue sky, leaving ships arriving from the Atlantic in July dangling from an invisible thread. The horizon gives way to a blue void that draws the soul northward. The trip is pleasant enough. When you really let yourself go, you soar high above the gulf, the taiga, and the permafrost, until you reach the tundra, where on a sunny January day you can drift off into the light of the north. The light from the northeast had scorched the backs of our eyes. We would never again be able to see as clearly as before. We would always have to return to the north, where the light, like an overpowering drug, dulls the senses to better assert its hold. Growing up in the dazzling light of the north condemns you to a constant search at ever-higher latitudes for this white light that cancels out the world’s ugliness. Our childhood played out on an overexposed film. In blinding haziness. We would build sandcastles as tall as we were and throw the Thénardiers into their crocodile-infested moats. The poor creatures would be poisoned and float belly up on the water. It didn’t take us long to work out that the sand was a giant blackboard we could write on. Unlike paper, which could at any moment be discovered at the bottom of a pocket or between two mattresses, the sand let us erase our words and pictures with a drag of the foot whenever inquisitive passersby approached. They say that during the persecutions, the first Christians would trace a fish in the sand as a sign of recognition. With the sand temple built and our limited knowledge of medieval architecture exhausted, one of the two of us would draw a sign on the beach to see what the other thought about saying a memorial mass. More often than not, we would trace an M. Other times we drew the Gaspé Peninsula, marking Matane and Rivière-du-Loup on the map. That was all we needed. We were the only two members of this outlawed sect. A creed devoted to the memory of a name. The noise of the waves covered our childish words. We sang the song of the sad dolphin, which I didn’t dare sing before the king for fear he suspected it reminded me of my mother. Then, after rounding up an audience of crab carapaces, abandoned shells, and empty sea urchins, we performed our play before these dead creatures. Hunted and distrustful. Always looking over our shoulders to make sure no one had followed us. Always making sure the wind was blowing hard enough to cover the sound of our voices. Always coming up with an alibi when asked what had kept us at the beach for so long. Sandcastles, yes, that’s right, we were building sandcastles. Which wasn’t entirely untrue. We built sandcastles for Micheline Raymond, professional cook, often enough. People out for a stroll who happened upon these mausoleums in our absence had no way of knowing which god they had been erected for. The high tide washed away our footsteps, castles, and memories. We would sometimes play out scenes from our childhood in Amqui with her. My sister pretended to be her; I played myself. There were scenes from everyday life and episodes we recalled involving family members. We had to remember them all. The time when… do you remember? I remember. We could have put all these stories together to make a gospel out of them. But the gospels have their limits. Ornithologists say that birds raised in captivity without their parents only ever produce the bare bones of their song. They know the basic patterns, but can never reproduce all the subtleties. Worse still, if birds grow up with other species, they might even borrow to form their own songs. They will have a personal signature, but their song won’t be exactly the same as the song of their own. That’s just the way it is. “The white cat she painted. The painting she signed. Eventually this ritual was all we needed. It no longer had anything to do with the person to whom we were giving thanks. The funny thing about memory is that it always ends up chasing its own tail. The most important thing is to keep it moving. On this freezing, windswept beach, there was, in addition to the crab shells and sea urchins that came to our theatre, all kinds of junk. One morning we found a beached minke whale. It was still alive. We watched as it struggled to breathe beneath its own weight. We watched it die. It took hours. We were surprised to see that its mouth formed a permanent, vacuous smile, despite its suffering. Its big, black eye stared back at us, opened, closed, then closed for good. Nature did what it had to do. The whale breathed its last beneath our gaze, smiling, as though content that we had accompanied it to its death. All that was missing for the scene to go down in history was to have Maria Callas stand beside the whale on the beach at Matane and sing La mamma morta. The whale soon started to smell and rotted slowly on the shore. We went back every day only to discover that the birds had torn away a little more flesh from its immense, cold body. It putrefied more quickly, and its ribs appeared. Two long white ribs could be seen clearly from the road, pointing skyward. I’m sure my sister remembers the hippie who pulled up in his Volkswagen, cigarette in mouth, to tear out two of the dead whale’s ribs. It took a few minutes of twisting and pulling before he could walk off with them. We later tried to tell them the story at home, but they were listening to a record and had no time for us. I think they were listening to Harmonium. You know the one… “Où est allé tout ce monde qui avait quelque chose à raconter? On a mis quelqu’un au monde, on devrait peut-être l’écouter…” Something about taking the time to listen to someone you brought into the world. They hummed along, looking deep into each other’s eyes. Our story of the beached whale remained untold. We must have been suffering from what the English call folie à deux. On the beach, the hippie kept tugging away at the minke carcass. We laughed and laughed at the strange man, me with a hearty guffaw and my sister with a more muted chuckle. The laughter transformed the memory of everything into an echo. 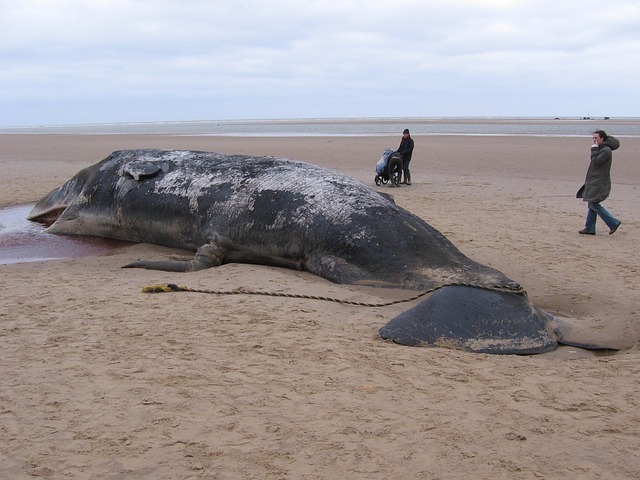 The beached whale also made me realize that I had a gift of seeing the future in animals’ entrails. Since I can’t get my hands on any marine mammals in the city, I sometimes read chicken and quail entrails. I can never see very clearly. Not as clearly as what the whale had to say. As it decomposed, the animal had partly revealed the future reserved for Anne Boleyn and the king. A stick was all it took to chase away the flies gathered above the carcass’s guts to see the whole story. The whale shared every little detail of it with me. Curiously, there was something of a disconnect between how the king and queen imagined their future and my prophecies. Nothing they saw in the short to medium term—Quebec’s separation, sailing around the world, a brighter future, the complete and utter obliteration of the memory of Micheline Raymond, professional cook—none of that appeared in the whale’s entrails. I saw separation ahead, but not for Quebec. Around-the-world trips, but not on a sailboat. Forgetting, but certainly not of Micheline Raymond, professional cook. Breathless, I tried to translate into human language for Anne Boleyn the sad destiny the sea reserved for her. I found her with my father, wrapped up in the new thrill of being pregnant. Something resembling decency forced me to keep my revelations to myself. I was going to have a half-brother. “Not a half-sister?” you say. No. The child would be a boy. It was what the king and queen wanted. Life in the Court of Matane will be out in bookstores on July 1. Click here for more information about the book. Originally from Ireland, Peter McCambridge holds a BA in modern languages from Cambridge University, England, and has lived in Quebec City since 2003. He runs Québec Reads and now QC Fiction. Life in the Court of Matane was the first novel he chose for this collection and the book that made him want to become a literary translator in the first place. His translation of the first chapter won the 2012 John Dryden Translation Prize.